Warlukurlangu Collaboration, 'Water Dreaming', Sculpture by the Sea, Cottesloe 2015. Photo Jessica Wyld. 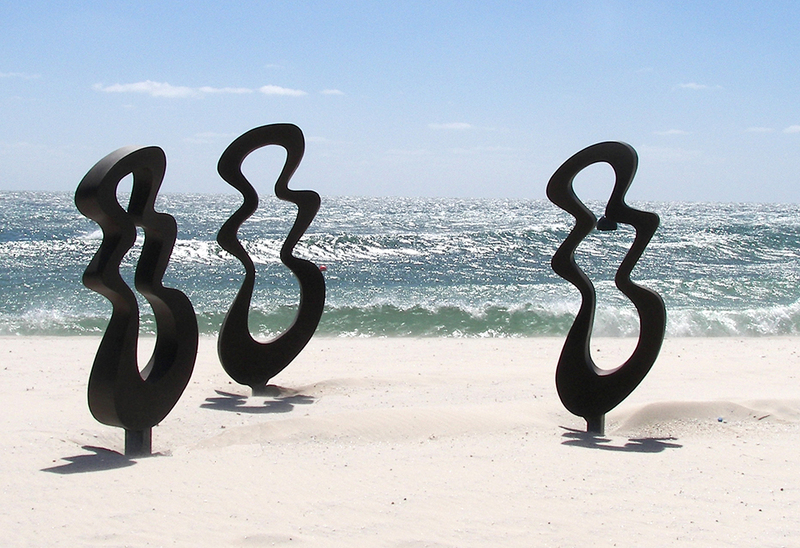 Tim MacFarlane Reid, 'Gestural Rhythms', Sculpture by the Sea, Cottesloe 2007. Photo Jo Coveney. Although Western Australia continues to produce some of the most significant artists of Australia, its relative isolation has meant that reputations forged in the west may take a long time to translate into recognition in the main art capitals of the eastern states. The situation is even more acute with sculptors, where frequently the cost of transportation and installation of sculpture is prohibitive and, not uncommonly, there is reluctance by commercial art galleries in Sydney and Melbourne to provide opportunities for Western Australian sculptors who have not already established their reputations amongst the gallery’s clients. Sculpture by the Sea at Cottesloe has, for over a dozen years provided a critically significant forum for the national and international display of sculpture in Western Australia. Not only did it create an opportunity for Western Australian sculptors to view their work in the context of sculpture created by a host of distinguished artists from elsewhere in Australia, but also from major art centres throughout the world – especially Europe, Asia and America. It also enhanced a West Coast – East Coast corridor with an increasing number of Western Australian sculptors exhibiting at Bondi and artists who had shown at Bondi also exhibiting their work at Cottesloe. Even before the inaugural Sculpture by the Sea at Cottesloe in March 2005, a number of Western Australian sculptors were showing at Bondi, some on a number of occasions and with considerable success. They included Ron Gomboc, Richie Kuhaupt, Nick Horn, Greg James and Kevin Draper. After the first Cottesloe show, the west came to Bondi in numbers and Jennifer Cochrane, Lou Lambert, Robert Juniper, Tim MacFarlane Reid, George Haynes, Catherine Higham, as well as many others, joined the earlier cluster of artists from the west coast. 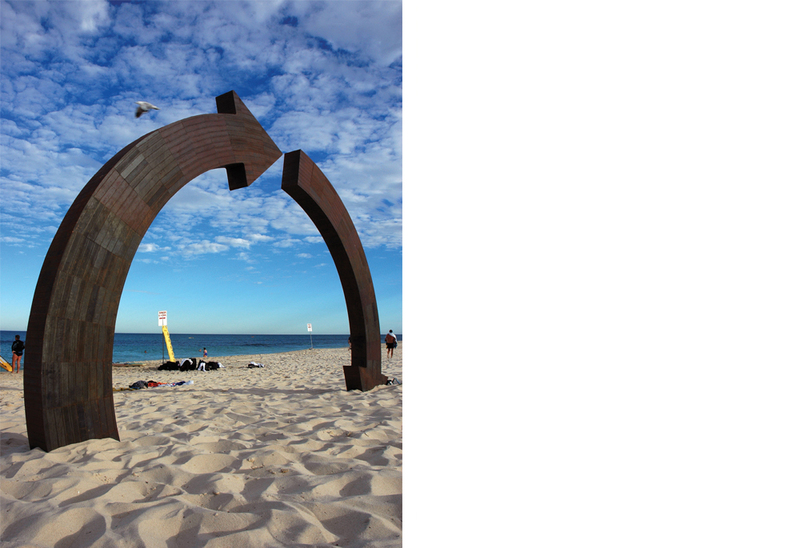 Apart from creating a new and culturally enriched venue for showing sculpture, Sculpture by the Sea at Cottesloe brought to the west a new concept in displaying sculpture, one where the exhibition was free, democratic and secular. It was an exhibition that appealed to a mass audience and used the spectacular backdrop of the Indian Ocean, with its unforgettable sunsets, as a setting for the display that incorporated the beach, foreshore, the sea wall and the Indiana Tea House. As in Bondi, the huge achievement in Cottesloe was the fostering of a new audience for sculpture in Western Australia where, between the outdoors display and the indoor showroom, many thousands of people came to see sculpture, with some of them pausing to acquire work for their own private collections, corporate collections as well as the local municipal authorities. A Sculpture by the Sea exhibition has the rare ability to demystify art and to make it publicly accessible. Commercial art galleries are frequently like temples of art, where the viewer feels the need to show reverence to that which is in front of them. At Cottesloe, sculpture can appear as fun – a family thing – where visitors may own the experience and can freely express an opinion. It is a huge free community event, one where some of the participants grow addicted to sculpture and start to collect it. 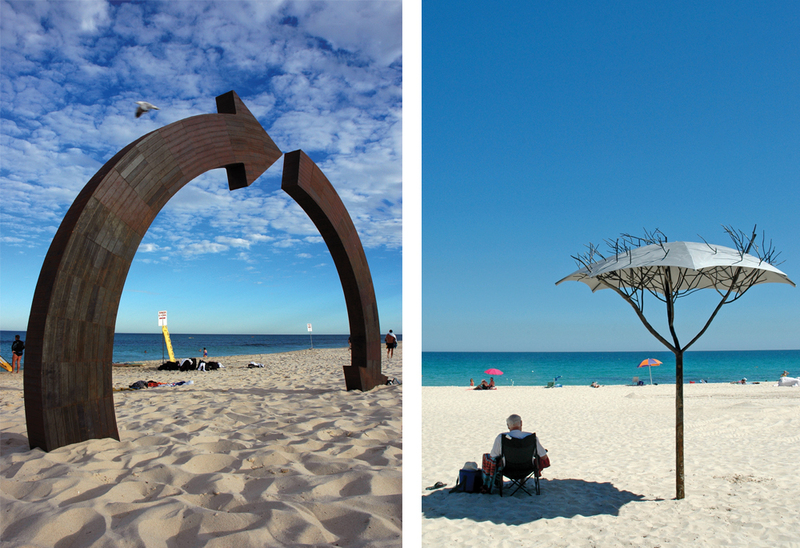 In 2015 sculpture sales at Cottesloe reached almost $2 million. Such is the fluctuating nature of the art market that the 2016 sales were half this amount. This has a significant impact on the artists and budgeting for the exhibition. The 13th Sculpture by the Sea exhibition at Cottesloe in March 2017 demonstrates both a consolidation of tradition as well as a certain evolution. If in 2005 there were thirty-eight sculptures, now the number has crept up to almost eighty. As the exhibition enjoys an international reputation and prestige, many artists of major standing throughout the world are applying to participate in the exhibition – in 2016, this included artists from eighteen countries outside of Australia. How exciting it is to be exhibiting Sir Tony Cragg RA and Zadok Ben-David this year. To be simply selected for inclusion in the exhibition has become an honour and for many successful artists this features prominently as a career highlight. 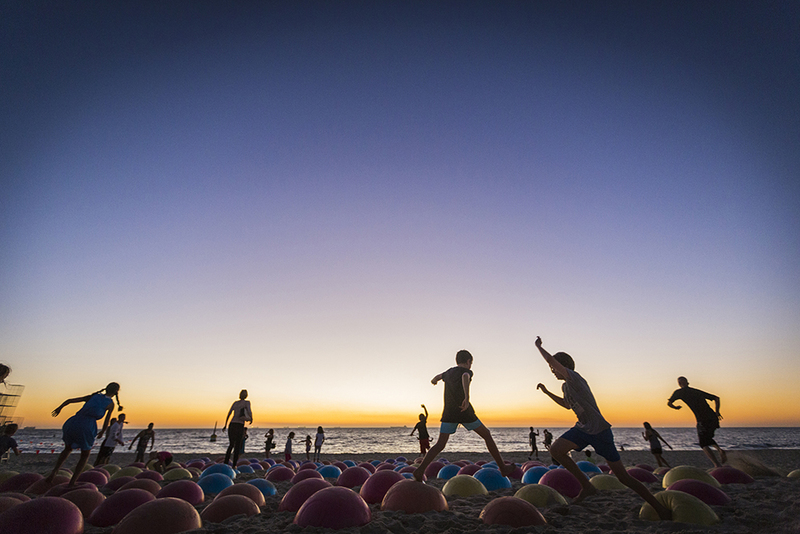 Attendances at Cottesloe in 2006 were approximately 45,000 visitors; by 2012 the figure had risen to over 220,000 visitors, making this the most popular public art event in Western Australia. Thus far, about 750 sculptures have been installed at Cottesloe and a number of artists’ careers have been launched here or at least received public acclaim and, on occasion, achieved commercial success. Apart from the carnival-like atmosphere, Cottesloe has become the crucible for creativity for all matters dealing with sculpture and a training ground for emerging sculptors. What has remained constant is the vision for Sculpture by the Sea. In 2005, the inspirational founding director, David Handley, wrote in the catalogue for the inaugural exhibition. “In staging Sculpture by the Sea, Cottesloe we hope to create a major free to the public sculpture exhibition for the people of Perth and its visitors … We hope the people of Western Australia enjoy Sculpture by the Sea, making it whatever they want it to be.” People have embraced the idea and it has now become a crucial part of the fabric of Western Australia’s cultural life.